Works great, I got mine as a gift and its nice, you can't hold it in one hand like you can a regular remote but it's harder for the kids to loose. The Buttons on mine liked to get stuck sometimes, but it worked fine, I think they are just a little too soft they like to get stuck under the edge of the plastic. We purchased the remote several months ago. Works great and more importantnly it is easy to find. We would spend hours looking for the remote in the couch, under the couch, and behind the couch, only to find out my son was sitting on it and hiding it. No longer with the jumbo remote. It's big and easy to use. The size alone saved hours of wasted time. Great purchase beacuse it is east to program and compatible with every television. The batteries last a long time as a matter of fact i don't remember changing them. Big buttons so they are easy to see not like the eye test remotes from the cable company. Very steardy , my kids put this to the test everyday and no problems thus far. if you are looking for a great universal remote this is the one. I would recommned this to family and friends or at least the ones I like. Very affordable and just a wonderful buy. Must have for large families. This Control should only be used as a novelty as a joke nothing else. The control is very hard to program to work on your TV. You should depend on this control as your only and primary control for tv. this control will eventually stop working that's what happened to me. 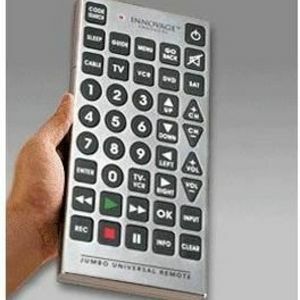 No problem seeing this Jumbo universal remote! Ever have trouble seeing the numbers or function buttons on your remote, especially in the dark, well you will not have to worry about with the Jumbo Universal Remote. It has huge buttons on it with very easy to read print. You will have no problem seeing the buttons. And for an added bonus, the Jumbo universal remote that I tried, had a glow in the dark buttons feature, so when you are looking for that function or trying to change the channel in the dark you don't have to get up from that comfortable spot ion the couch. I thought that was a very convenient feature. Also, another wonderful added bonus to this monstrosity is the fact that you will not lose this remote. It is SO big, there is now way you can lose it. You place it somewhere it will be there. The compatability with the device brands is great as well. All in all I give it 5 stars for functionality and convenience. I recommend this in any home that contains an electronic device, even if you don't have multiple devices. Great for us old folks! My husband bought two of these more as a joke than anything. I wouldn't trade mine for anything! At 54, I am just starting to have trouble reading. This is amazing. Noo more problems. I had it programed in minutes. I found the code for my cable box but had to search for my mongrel LCD TV. Found it on the second or third try. Not a big deal. Because itis so big, I keep it next to the bed. If I have to get up in the middle of the night, I turn on the TV and it acts like a night light. (We turn the volume all the way down before we shut it off for the night. I would definately recommend this. 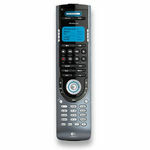 What is the deal with so-called universal remotes that can't program? Ugh! We got this one because it looked neat, but then it wouldn't find our TV. Not manually, not automatically. And it's not my TV... I've since gotten a different remote that works fine. We bought this remote for my father inlaw and he loves it as he is getting up there in age it is so much easier for him to see the numbers and different functions on this remote.it has been one of the best gifts and most used gift we have gotten him for quite awhile.He just loves it and very easy to set up and use. I bought this for my parents as a joke. THEY LOVE IT! It was easy to program and is really easy to use. My mom said she doesn't even have to put on her glasses or turn on a light to use it. The price was definitely right. We were able to program the TV, VCR, DVD player and stereo receiver all to be controlled by the one remote and some of the components are kind of old. All of the codes we needed were right in the manual. Not always cheaper means better!! I never make this item works out. You may spend several hours tryng to make this big unesthetic piece works out and you are going to get only a big headache and a lot of frustration. I never found the code of my TV and my DVD player. Even the automatic search code feature never worked out. In addition, I tried to get some information about this product and the company which fabricates it and as you can imagine about all these chinese companies which products are cheap,...right I never found any web site or any reference. After struggling almost two days making this big brick works properly, I went to the store where I purchased and returned it.